Since entertaining our first guests in 1859, the Menger Hotel has remained at the epicenter of commerce, trade and society events in San Antonio. 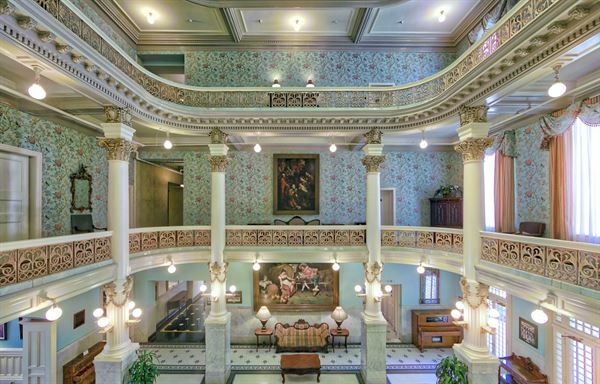 Today, the Menger’s splendid Victorian-inspired architecture and interiors remain, but a series of extensive refurbishments has left the hotel with a contemporary spirit perfectly suited for any event. Whether you’re planning an intimate board meeting, sales conference, birthday party or romantic wedding, we offer unique, elegant event spaces in San Antonio that are perfect for any and all of your needs. Our centerpiece venue is the elegant Grand Ballroom, which can accommodate sales conferences, product presentations and dinner banquets of up to 750 guests. For smaller gatherings, the hotel offers several intimate boardrooms and meeting rooms. Light Luncheons | $24 - 30 per person • Chef's Salad • Grilled Chicken Salad • Caesar Salad • Deli Lunch Plate • The Hoagie Club Plated Luncheon | $27 - 36 per person • Chicken Champigon • Chicken Piccata • Chicken Acapulco • Steak Maitre d Hotel • Pan Seared Filet of Snapper • Tortilla Crusted Tilapia • Linguini Bolognese • Pasta Primavera Luncheon Buffets | $33 - 40 per person • Fajita Station • Pasta Station • Deli Buffet • Italiano Buffet • Fiesta Buffet • All American Please see attached PDF for additional information and menu options. Morning Break • Orange Juice • Sliced Fresh Fruit and Yogurt Dip • Assorted Breakfast Bakeries with Fruit Preserves and Butter • Regular and Decaffeinated Coffee And Novus Teas Mid Morning Break • Regular and Decaffeinated Coffee, Novus Teas, Assorted Soft Drinks and Bottled Water Afternoon Break • Assorted Cookies and Brownies • Regular and Decaffeinated Coffee, Novus Teas, Assorted Soft Drinks and Bottled Water Please see attached PDF for additional information and menu options. Dinner Entrees | $37 - 52 per person • 12 oz Rib Eye Steak • 12 oz New York Strip • 8 oz Filet Mignon • Grilled Pork Chop • Pan Seared Snapper • Grilled Salmon Filet • Trout Alamandine • Stuffed Tilapia • Shrimp Scampi • Seafood Chili Relleno • Tri Color Tortilla Crusted Tilapia • Chicken Florentine • Grilled Chicken • Chicken Scaloppini • Chicken Oscar • Chicken Champignon • Chicken Milanese Dinner Buffets | $45 - 65 per person • The Mediterranean • The Cajun Buffet • Seafood Buffet • Fiesta Buffet • Italiano Buffet Please see attached PDF for additional information and menu options. Our wedding packages include the following: • Sparkling Wine or Cider Toast for all wedding guests • Complimentary Cake Cutting Service • Dance Floor and Staging for Head Table • Guest book table, gift table and DJ table • Complimentary tasting • White Linen with white napkins • Complimentary suite for the bride and groom on their wedding night* • Complimentary amenity in the guestroom for the bride and groom on their wedding night • Complimentary Breakfast from Room Service on the morning after for the bride and groom • Discounted Friends and Family Group Rate for overnight accommodations **There is a $7,000.00+ food and beverage minimum in order to receive a complimentary night or a $3,500.00++ food and beverage minimum to receive an upgrade at your special rate. Please see attached PDF for additional information and menu options. Host your next meeting or corporate event in the Cavalier Room. This unique venue provides high wood-beam ceilings, and floor-to-ceiling white wooden plantation shutters overlooking the Spanish courtyard garden. The Cavalier Room is an intimate space, accommodating up to 30 guests. Perfect for your next corporate event or meeting, this room is pre-set boardroom style and features a conference table with seating for 12. Spectacular crystal chandeliers set the mood for your elegant event. Use the entire space for your guests or partition the room into three smaller areas, as you wish. Adjacent to the ballroom is a pre-function area that opens to a terrace overlooking Menger Court, a common area between the hotel and Rivercenter Mall. Both the poolside terrace and Menger Court provide inviting space for receptions under the stars. Accommodating up to 300 guests, this space includes a large dance floor and would be a great location for your hors d’oeuvres reception. Our second largest space is the Minuet Room, the Menger’s original ballroom. Its elegant Victorian ambiance features a fireplace, dance floor and doors opening onto the Spanish courtyard garden and pool area. This space can accommodate up to 120 guests. Decorated with Southwestern style, this room features log beams across the ceilings and wrought-iron light fixtures. Your guests will enjoy a small dance floor and doors opening onto the Spanish courtyard garden and pool area. The Patio Room accommodates up to 80 guests. This second-floor reception room is located in the hotel’s original wing next to the rotunda. Your guests will marvel at the decorative plaster ornamentation on the ceiling featuring abstracted urns, shells, lyres and anthemion motifs. The mantelpiece is identical to the one found in the Colonial Room Restaurant. French doors open to a private balcony overlooking Alamo Plaza. The Renaissance Room accommodates up to 50 guests. Located Downtown, we specialize in Corporate Events & Weddings. Offering 10 distinct venues to choose from. Smoke BBQ Brew Venue is Downtown's Premier Event Center! Located in the heart of Downtown San Antonio near Sunset Station and only a few steps from the Alamodome, Henry B. Gonzalez Convention Center and the River walk, Smoke BBQ Brew Venue offers your group combined venue seating from 20 to 1,200 and reception space for up to 2,300 guests. We have 10 distinct indoor and outdoor venues for your to choose from: SMOKE SPORTS BAR BAR 1168 THE PALACE FLOOR WAR ROOM ASH BASEMENT BAR EMBER ROOM SPEAKEASY BAR SUNSET TERRACE PALACE BALCONY ST PAUL'S COURTYARD EAST COMMERCE PLAZA In working with both our corporate and non corporate guests we have learned two things: People want to know (1) do we have the date available for their group and (2) how much is it going to cost. My name is Adrian Martinez and I am the owner of the venue. Feel free to text me and you will get an immediate response to all of your questions! We are a full-service catering kitchen. Our team can customize a menu for you. Our specialty is BBQ but we can accommodate a variety of special menus. Located less than two miles from the San Antonio International Airport, Hilton San Antonio Airport features 384 tastefully appointed guest rooms and suites. Additionally, there is more than 17,000 square feet of meeting and event spaces. Plus Asado Seafood and Grill. Hilton San Antonio Airport is a proud recipient of TripAdvisor’s 2016 Certificate of Excellence Award. To qualify, lodging establishments must maintain an overall rating of four or higher as reviewed by travelers on TripAdvisor®, the world’s largest travel website. All associates at Hilton San Antonio Airport take great pride in consistently delivering an exceptional guest experience. Courtyard will fit your group or event perfectly! Our hotel offers 179 guestrooms, including 49 suites. Our guestrooms will offer today’s modern conveniences without compromising comfort. Each guest room includes amenities such as, complimentary high-speed internet access, a 32” high definition LCD television, remote-controlled cable TV, pay per view movies and games, an in room coffee maker, iron with ironing board, hairdryer, mini refrigerator, work desk with ergonomic chair, two telephones with speakerphone and voicemail. With 8,000 sq. ft. of flexible meeting and banquet space to accommodate up to 600 guests. Finding the ideal venue is the key element in planning your special day. Located on the New Museum Reach Expansion of the San Antonio Riverwalk, El Tropicano has long been a beautiful, inviting location for every phase of your wedding. We offer all the romance, charm and elegance every bride expects, without the hefty price tag. At El Tropicano, we want your wedding to be as unique as the love it celebrates. Let the City of San Antonio be your ultimate backdrop for an event to remember, our versatility and flexibility is like no other venue, and our specialized event managers will help set the stage for a truly unforgettable experience, tailored just the way you want it! Mother Teresa Santoyo's Center is a unique reception venue, managed by Feedback Catering. This venue is perfect for wedding receptions, quinceaneras, sweet sixteens, school reunions, dinner galas, and more. Josabi's is located in Helotes, TX on over seven acres of land. We are located just five miles outside loop 1604 on Bandera Road. We would love to be your preferred venue for your next event. We have multiple options when booking an event at Josabi's. We have two beautiful and spacious outdoor patios, an outdoor stage/band/DJ area, and two indoor areas that comfortably sits a large party for weddings, receptions, birthday parties, baby showers, gender reveals, quince's, reunions, retirement, etc... The options below are so versatile, they can accommodate intimate celebrations of just 40 guests and are perfect for celebrations of up to 500 guests. The rustic, industrial setting is a blank canvas with endless options for decorating for your event. Kitty Hawk Event Center could be the perfect location for your wedding, reception, or formal affair. We've hosted theatrical productions, luncheons, weddings, and community showcases. Our facility will seat up to 410 people comfortably, and comes with stage, sound, and anything you would need to put on your dramatic play, poetry hour, or business debut or maybe you need to display some art, host a wine-tasting, women’s club, youth groups or even monthly men’s meetings. We are also equipped to host daily fitness classes, any type of weekly sports/ recreation activities and/or programs, and community support group meetings. We also have a catering kitchen that can be utilized as well, in case you would like to provide food for your guest’s onsite. Our facility is your blank slate and can be easily transformed to suit your decorating needs. We have large circular tables that can easily seat up to 8 people comfortably and nice comfortable chairs.